Have you heard the buzz about the new minimalist shoes in the market that look a lot like Vibram FiveFingers? If you haven’t yet then meet the Fila Skele-Toes! Fila Skeletoes sell for almost half the price of the popular Five Fingers. 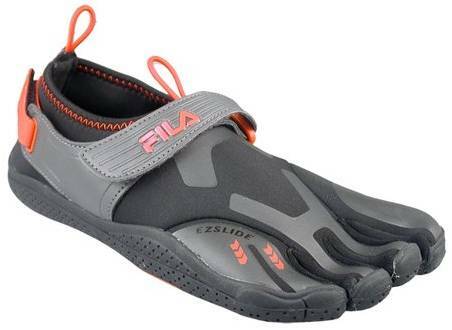 However, rumor has it that “Fila does not see this product as a direct competitor to the Five Fingers.” What’s more, unlike the FiveFingers, the Skeletoes only have four pockets for the toes. The smallest two toes are going to share one pocket to allow an easier entry also known as “EZ-Slide” which likewise addresses the VFF users’ pinky problems. Another main difference between the new player Skele-Toes and Five Fingers is the latter is being marketed as a performance or fitness shoe. The former on the other hand was not designed by Fila for running but for casual activities to be used by both active children and adults who are not into performance pastimes. These casual activities can include boating, swimming, biking and walking. The Skeletoes were made to be the perfect companion of performance footwear. It is a comfortable and less expensive alternative for your feet after a hard work out, run or climb in your favorite barefoot shoes. So let’s say you’ve just had an exhilarating 5 mile run and wish to have a more relaxed walk back to your place. Instead of increasing the wear and tear of your beloved Five Fingers, you can slip on the more affordable Skele-Toes. This way, you are not only getting protection for your feet as well as the health benefits from barefoot walking, but you are also prolonging the life span of your Vibram shoes. If you are a serious barefoot enthusiast, you may find the Fila Skeletoes are a bit thick in the sole and not as flexible as the VFFs. Nonetheless, if you are like many others who want to experience the joys of barefoot walking but can’t seem to handle the vicious attacks of pebbles and stones then the Skeletoes is for you. These shoes are minimal enough that they don’t affect your walking gait in addition to giving you some ground feel. The uppers may look like Neoprene but it’s not. It’s actually a four way stretch two ply nylon. It has two bungee cords to make it real easy to slip on – one at the top of the instep and the other at the heel. Its Velcro straps are similar to the VFFs where one strap goes over the foot while the other is used to tighten the shoes at the heel. Furthermore, the Skeletoes’ multi-purpose rubber outsole provides great traction and better protection. You will surely hear much about Fila Skeletoes in the coming weeks. Not only that but it will certainly be compared a lot to Vibram FiveFingers too just because it sports a comparable look. Depending on your need, it is best to remember that the Skele-Toes were not made to compete with Vibram, rather it was intended to complement it. Price-wise, Fila Skeletoes are quite affordable and great for Men and Women. What is your take on this? looked at a pair in the store. not impressed with the quality of material used and looks like it makes more issues with breathability. I got pair and used them for running and i love them, there light and fit nice. I just got a pair and I love them.I usually don’t like this type of shoe but the skele-toes rock. so i jsut got a pair yesterday and have worn them all day and they seem to be comfy.. i havent ran in them yet but plan to later on today. so far they seem to be fine but i also have never tried the vibrms before so i have nothing to compare them to. so far so good! Hmmm, I wish I had read this or did way more research. I saw these shoes and thought they were a cheap alternative to Vibrams. I bought them and immediately started running in them. I started off slow and worked up to running in them in my first ever 10k. I finished the race but 2 hours later, I couldn’t put any pressure on my left foot. I ended up in a boot and having to take time off. I will be going back to a running shoe as fast as yesterday. I loved my first pair so much I rushed back to get a 2nd pair to take to the Bahamas on vacation this year! I am completely taken with them!!!! Run, walk, they are the best I have ever had on my feet.